A division bench of Justices G S Sistani and Vinod Goel of the Delhi High Court has asked the Government of Delhi and the Delhi police which comes under the Ministry of Home Affairs(MHA) to file a reply in a writ petition filed by Fatima Nafees, mother of JNU student Najeeb Ahmed. According to the petition, her 27 year old son Ahmed was a student of MSc. Biotechnology (1st Year) Jawaharlal Nehru University. He called her at around 2:30 am in the morning of October 15, and informed her of something had happened to him. Worried about Najeeb, Fatima left for Delhi with her second son Mujeeb. Upon reaching Delhi she called her son again and told him she will be coming to his hostel room, Najeeb confirmed that he was at his hostel. But after reaching room no. 106 in Mahi Mandavi hostel of JNU between 12-1 pm on October 15, Fatima discovered that her son had gone missing. Fatima also found out from other students that Najeeb was beaten by members of the Akhil Bhartiya Vidyarthi Parishad(ABVP) on October 14. After Najeeb’s disappearance, an FIR was registered on October 16 however there was no mention of the assault on Najeeb. According to the petition the members of ABVP assaulted Najeeb, and since ABVP is affiliated to the RSS it implies that it is closely connected to the ruling party, BJP. Hence the petition has reasoned that the High Court should appoint a Special Investigation Team consisting of members with “proven integrity from outside Delhi” to take over the investigation from the Delhi Police crime branch. JNUSU President Mohit Pandey has also filed a complaint before the police stating that he was present at the time of the attack on Najeeb, he has also named the attackers. 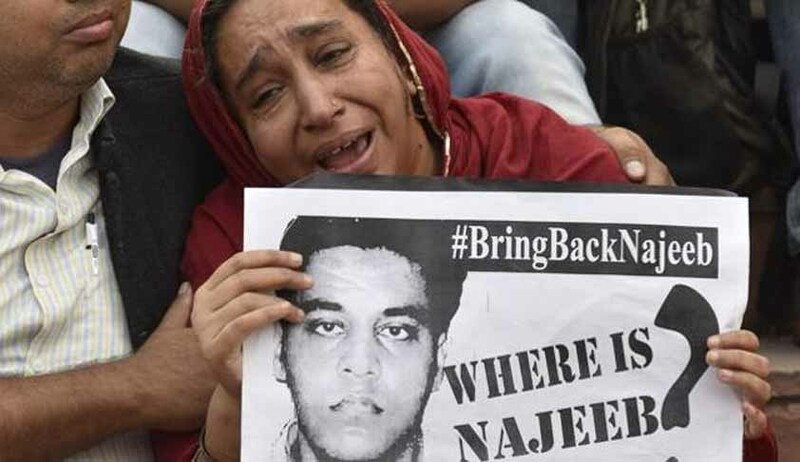 The Delhi Police has increased the reward for providing leading information about Najeeb from Rs. 50,000 to Rs. 5 lakhs. The bench has also directed the Delhi police to file a status report on the investigation carried out so far, within three days.